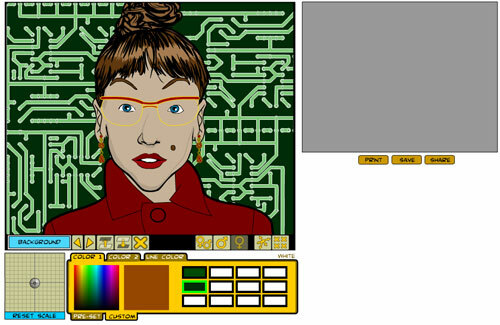 Moved the character canvas area with colors and buttons to the left side of the screen, and the ad over to the right. Since most people expect the most important part of the page to be at the upper left, I think this works a bit better. Massive update of items -- every item slot now has what I think to be a reasonably solid, complete set of options from which to choose. Changed the item slot selection boxes from being separated out and visible at all times to being in a collapsible selection box like in HeroMachine 2. I probably need to add a little arrow in that box to make it obvious what it's for. Basically though you just click on the item slot name and a pop-up appears with all the other options. Made the action buttons icons instead of text-based. Added "gender" buttons, which basically just skip the beard and mustache if you're randomizing the face. Created space for preview boxes which I am reluctantly going to have to add by hand. Sigh. They'll go on the bottom right, below where the "Share" and "Save" buttons currently sit. Fixed the bug where the scaling button would keep moving even after you moused out of the box. The scaling button now moves to the appropriate spot on the grid to reflect how the currently selected item is set when changing slots. You no longer get "blank" items for essential slots like Forehead, Jaw, Nose, etc. Before you'd get some really bizarre looking results with Random Face, with the background showing through and such. You can still make those slots blank manually if you like, of course. I'm very curious as to how you think the new layout and collapsing the item selection boxes into a pop-out menu works versus the previous method of keeping them out at all times. Feel free to leave your suggestions, observations, complaints, and/or compliments in the comments below. Or if you're shy, you can email them to me directly either via afdstudios@gmail.com or through this blog's "contact us" page. Thanks in advance for any thoughts you'd like to share regarding the program thus far! I recently started using the HeroMachine and I’m new to the facemaker. I’ve tried the new beta and was able to make an image which resembles my own face, so that works. I really like the scaling and moving option, which I sometimes miss in the HM. The visual interface of it has really improved from the last version. The way that the item slot boxes were displayed in the previous version, I liked better, but since you have to make room for previewboxes (which are very useful), I understand the choice. Placing the canvas-area to the left is a good descission, especially for those who already use the HM. The icons could be a little more indicative of what the button really does and when it’s ‘on’. The option to save as a jpg-image is very useful, since some users have a little trouble with copying and therefor publish less quality images. In the color-department I miss the alpha-channel from the HM. And maybe it’s an idea to add a way to fill in color-codes. Would it be possible to add more than one item of the same category? For example, I used the jewelry-item to create an eyebrow-piercing (a moved lip-piercing), but I would also want to add an earring. Also in the item-department, I’d like to see some facial lines, so that older characters would become more believable. Once you have scaled items and you use the random-button, the faces look really weird. Maybe it should automaticly reset the scale or there should be a ‘reset all scales’-button. Being new to the facemaker, I have to say the application as a whole is very well done. Thank you for working on another great product! Thanks for the feedback, Maxx!